A salad with no dressing? None required with sweet and smoky tempeh. I’m in this phase with salads lately…maybe it’s just the heat of summer…where I simply like to dress the leaves with a squeeze of lemon or lime juice and a bit of sea salt. Nothing else. But this only works for me when I have something very interesting to top the salad with, and that’s the story of this recipe. Tempeh is a cake made out of whole fermented soybeans. The texture is completely different than tofu, which is basically curdled soy milk. 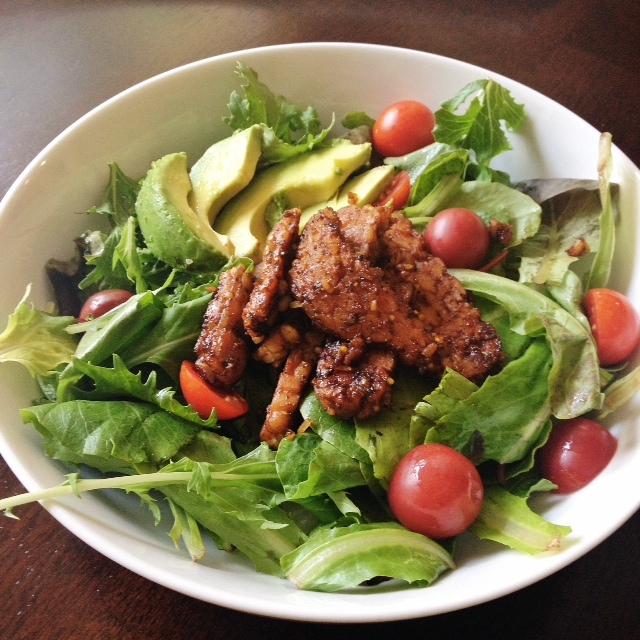 Just like tofu, tempeh needs a little help to become exceptional. But it’s very easy to work with, once you know what to do. 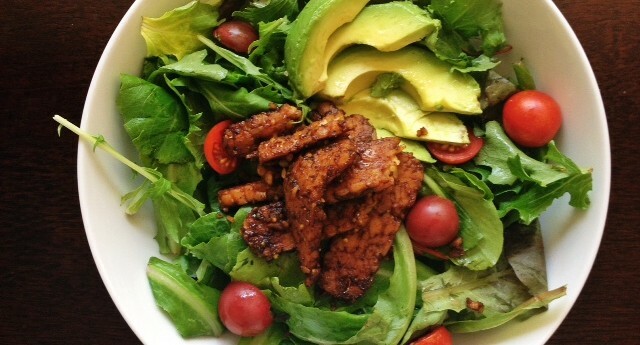 Tempeh can have a bitter flavor which is off-putting if you’re not used to it. This is eradicated by marinating or steaming it as part of the recipe preparation. You’ll see below I’ve simmered the tempeh in the marinade ingredients for a short period of time, this works as well. Look for tempeh in the refrigerated section of the market close to the tofu. As with any soy product, buy organic to ensure you’re getting a clean, gm-free food. Make a marinade by mixing together the maple syrup, tamari, cumin, paprika, cayenne, garlic, pepper, and salt (if needed). Stir in the tempeh then transfer to a heated pot with a lid and simmer, covered, for 10 minutes. After 10 minutes, lift the lid and raise the heat to reduce the sauce and brown the tempeh a bit. Stir occasionally…don’t worry if there’s minor breakage. Tempeh is done once all the sauce is clinging to the slices and there’s a nice color on either side. Toss the salad greens with the citrus juice and a small amount of salt. 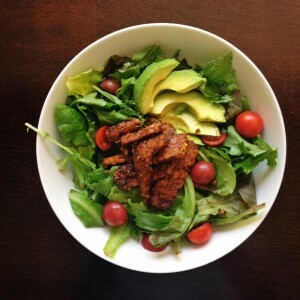 Top with the tomatoes, avocado and tempeh. This recipe is vegan and delicious. Gluten-free but not grain-free because of the tempeh. They’re most likely out there, but my shops don’t carry a grain-free tempeh.